What does ITD OSS mean on my boarding pass? 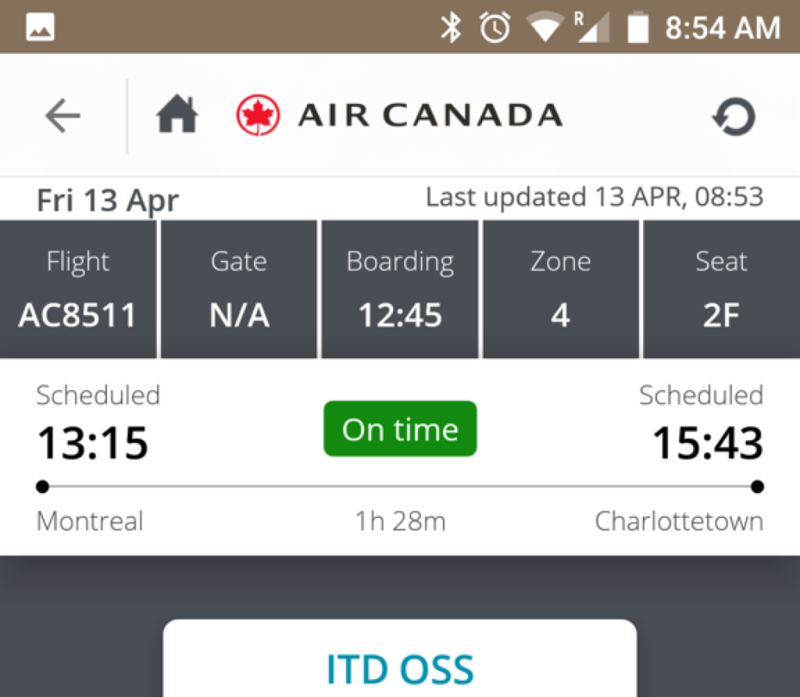 I noticed that my electronic boarding pass for my flight from Montreal to Charlottetown this afternoon had ITD OSS above the QR code, which I’d never seen before. Some poking around revealed this this is an indicator for International To Domestic One Stop Security, and is the new system at Trudeau Airport that allowed me not have to exit customs, go back groundside, and go back through security again to continue my journey when connecting from the Boston to Montreal flight. This is the first time I’ve benefited from this: upon arrival in Montreal, I was directed to a special customs area for connecting passengers. I went through the normal customs procedures, and then exited directly into the airside departures area. This was a huge time and anxiety saver: at busy times in Montreal, having to exit and re-clear security could add 45 minutes to a connection. Written April 13, 2018 at 8:34 p.m. I also has this designation indicated on my boarding pass. I also saw a note in my flight info saying I did NOT have to go through security again. However...after going through the customs kiosk, I saw nothing that indicated where to go to disadvantage of this. So, just like every other time, I followed the Exit sign. Next thing you know, I've passed the point of no return. An AC rep informed me that since I was there I had no choice but to go back to departures and get screened. Again. Ugh. What should I have done differently? Ask the AC people standing around. I believe that’s what they are there for—to direct the traffic. Just had this experience myself at Pearson. Worked great! Yes, the AC tell you where to go and a shuttle wait for you to the other Fly. Also, when you have NEXUS , it' s goes fast. It' s new and you don't have to wait , specially when you have short connection. Just had this experience myself at Pearson. Worked great ! Had this on our boarding passes as well. It's a great, great feature if you happen to receive it. We arrived from Baltimore to Trudeau airport in Montreal and had to connect on to Calgary. While everyone else went towards the exit sign, we asked an AC employee where we needed to go. He indicated to us to follow the purple "connections" signs. We eventually came to the customs declaration terminals...did that, then continued on as directed by CBSA staff, showing our boarding passes as we went. We did not have to go through security at all. A huge time saver for us. But, as another traveller previously said above - make sure you ask, and don't follow the crowd. Safe travels to all!